My name is Nicoelle Danielle Cohen. My alma mater is Marjory Stoneman Douglas High School (MSD) class of 1995. I am an artist and an alumna of Pratt Institute in Brooklyn, NY. As an artist, I wanted to use my visual voice to honor the victims of the mass shooting at MSD High School in Parkland, Florida on February 14, 2018 where 17 students and staff were killed. I really wanted to do something to spread LOVE. I was completely devastated and heartbroken. On February 20, 2018 I put out a call on Facebook for handmade fabric hearts to help me spread LOVE in a time of such deep sadness. To date, I have received 1,000 handmade fabric hearts from people all over the country (and the world, including Scotland and Tanzania). The hearts have traveled and have been displayed in heart installations in Parkland, Coral Springs, Deerfield Beach and Delray Beach, Florida; Burlington, Vermont; Denver, Colorado; Las Vegas, Nevada. I recently made hearts with the current MSD yoga students and with their help, I displayed the heart installation for them in the gym. 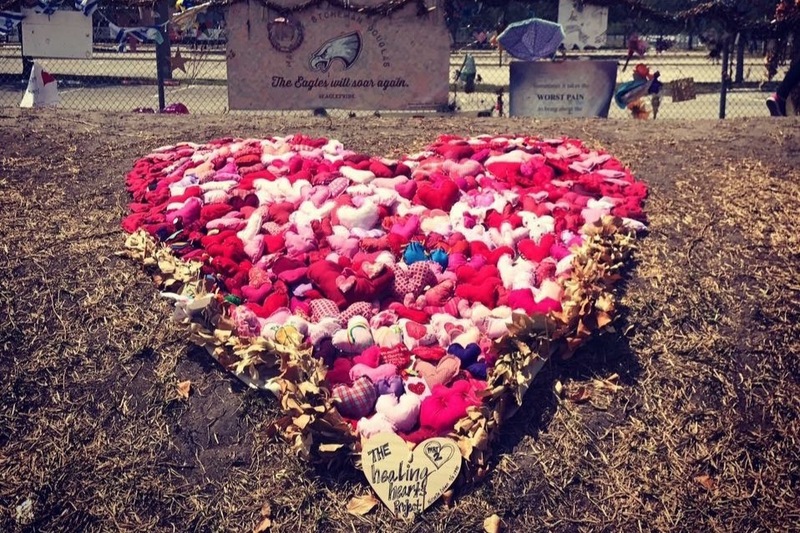 They added their hearts to the hearts already collected and this was an incredibly healing experience for all of us. On February 14th I brought the heart installation to Deerfield Beach where an event for the MSD families and students was being held, called 'A Day of Hope and Healing'. After speaking with the heart making participants and viewers of the installation, I noticed how they reacted. Some have cried, some take photos, some just want to touch the hearts and read the messages of love. It’s helped me fully grasp the power of healing through art and how this project has the ability to help those around the country heal. The end goal for the Healing Hearts Project is to continue to spread love and support, to all of the victims, the survivors, the families, the friends and the communities that are impacted by gun violence every single day, by using art and hearts as healing. With the outpouring of our global community participants creating handmade hearts and by bringing them together in an art installation we are using our collective voice to help continue the much needed conversation and discussion about common sense gun control around the country. This has all been an act of service and fully self funded but as the projects grows and continues to evolve I am reaching out for support in helping me spread this message of love to as many people and to as many places as possible. I am asking for your support and help with travel expenses including gas, car rental, airplane tickets, lodging, food and the materials needed to make the hearts. If you would like to make a tax deductible donation please email me at healingheartsproject2 @gmail.com and I can send you a link to be able to do that. 2. gift cards to grocery stores, gas stations, craft stores etc. I will be documenting each place I visit so you can follow the Healing Hearts Project journey along the way on Facebook and on Instagram. I am planning on visiting the cities posted below throughout the year where I have the help of my friends and fellow MSD Eagle alumni. their hearts to the installation. nonprofit in that area of my choice. making event at the New Orleans Healing Center. Action and Students Demand Action. Installation and community heart making event at Skinny Pancake. campers for the Tree of Life Synagogue. Dates TBA for the following cities below. I appreciate any amount of help you can offer. 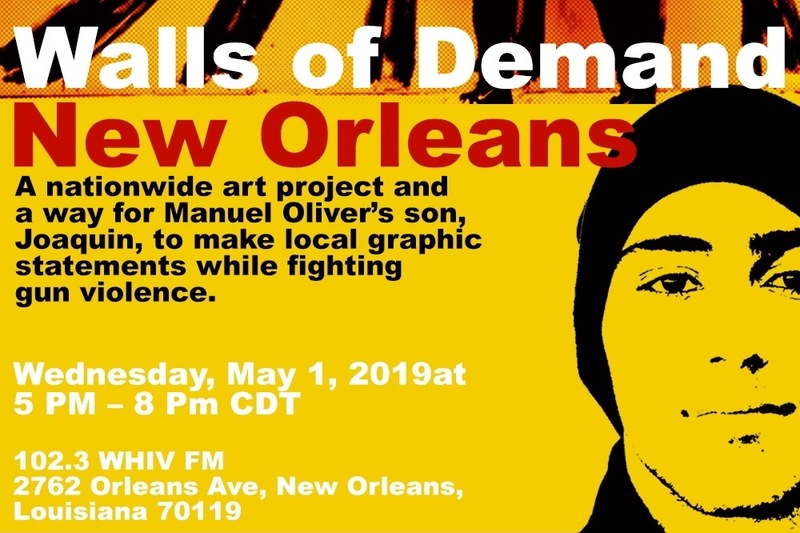 Change the Ref will join us in New Orleans at the Healing Hearts Art Show. Please join us if you are in town. Thank you. Info about the event is on the Facebook page in the event section.